Smiley faces are so last century. Kids these days are all about emojis, the little icon picture set you can add to your phone keyboard. How else can you communicate your love of pizza, kittens, tacos, and nail polish, all in the tap of four keystrokes? I’m addicted to using them–they’re genius, and so darn cute. So this Valentine’s Day, I’m taking my love of my favorite emoji, the heart-eye emoji, off of the screen and into my kitchen. These Oreo Pops couldn’t be any easier or any cuter. You need just a few minutes and a couple of ingredients to make them. They last for ages, so you can make them weeks in advance and then just store them in an airtight container until you’re ready to serve them. 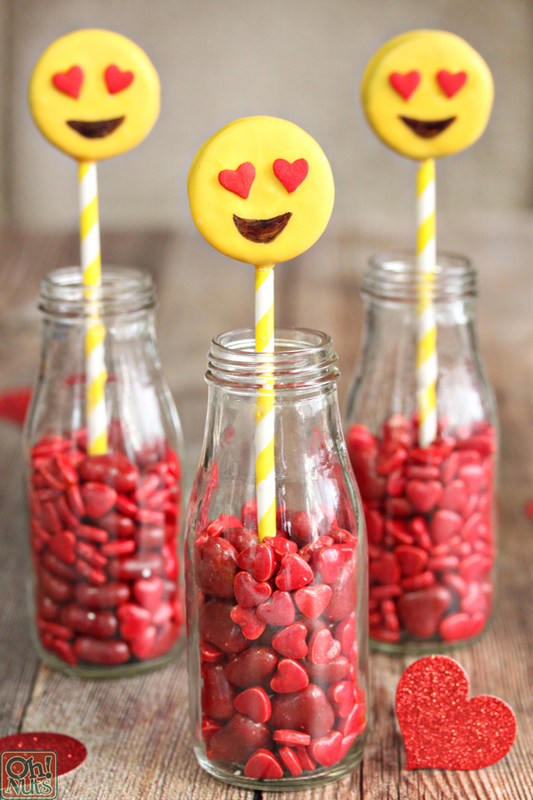 Make them for a party, or package them individually and give them out as Valentine’s! I guarantee you’ll be the toast of the office/classroom/book group/[insert your social group of choice] if you make these for your friends! Start by melting your yellow wafers in the microwave. Put them in a microwave-safe bowl, and melt them in 30-second increments, stirring after every 30 seconds so they don’t overheat. Keep melting and stirring until they’e smooth and fluid. Twiiiiiiiiist all of the cookies apart. Pause to admire your handiwork, and resist nibbling on the cream filling. That part can come later! Dip the tip of a lollipop stick into the melted coating, covering about 1/2 an inch at the top. 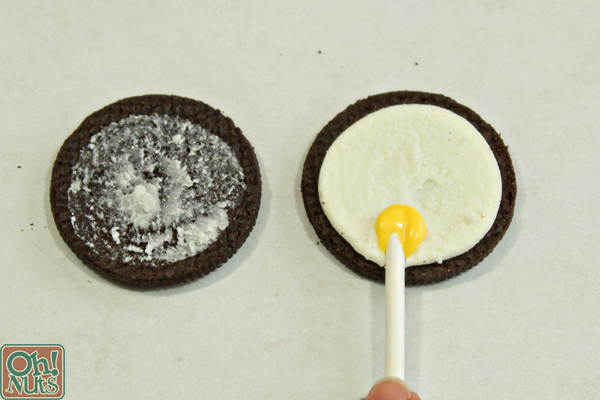 Press the end of the lollipop stick into the cream filling of the cookie. 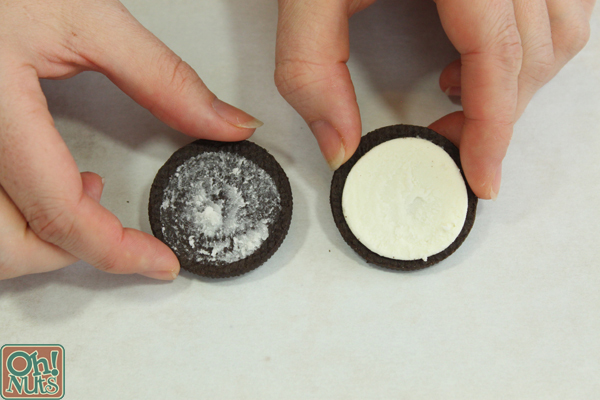 If you’re not using Double Stuf Oreos (or even if you are!) consider smearing a small amount of coating on the rest of the filling before you close the cookie up. 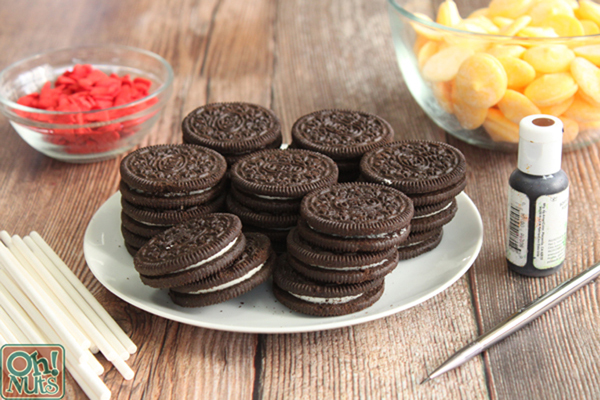 Regular Oreos aren’t quite wide enough to accommodate the lollipop stick, so they tend to come apart when you dip them if you don’t add a bit of coating to stick them together. Even Double Stuf Oreos can sometime fall apart, so I like to add a bit of insurance by way of extra candy coating. At any rate, press the cookie halves together, and repeat until all of the cookies have lollipop sticks in the middle. Refrigerate the cookies briefly to set the coating, for about 10-15 minutes. 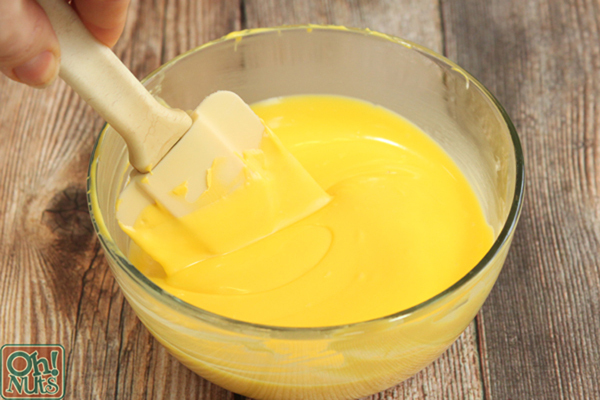 If the yellow coating in the bowl has started to set, warm it up until it’s liquid again. Dip a cookie into the coating until it’s completely covered–you might find it easiest to use a spoon to help pour the coating over the cookie. Hold it over the bowl so the yellow coating can drip back down. Lightly scrape the bottom of the cookie on the lip of the bowl, to remove any excess, then place the dipped cookie onto a baking sheet covered with waxed paper or parchment paper. While the coating is still wet, press two heart sprinkle or heart candies on top of the cookies to represent the eyes. They are already starting to get so cute! 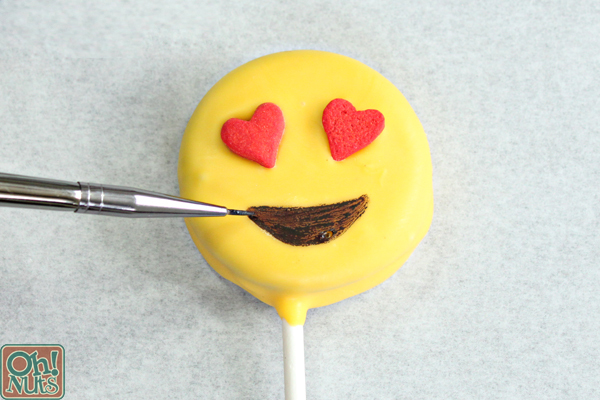 Repeat the process until all of the pops are dipped and decorated with heart eyes. Refrigerate the tray to set the coating, for 15-20 minutes. Once the coating is totally set, add the mouth. You can either use a food marker, or use food coloring and a tiny paintbrush. I find my food markers dry out quickly, so I used food coloring to get a stronger, bolder color. Whichever method you choose, add an open-mouthed smile on each pop, and let them dry completely before serving. 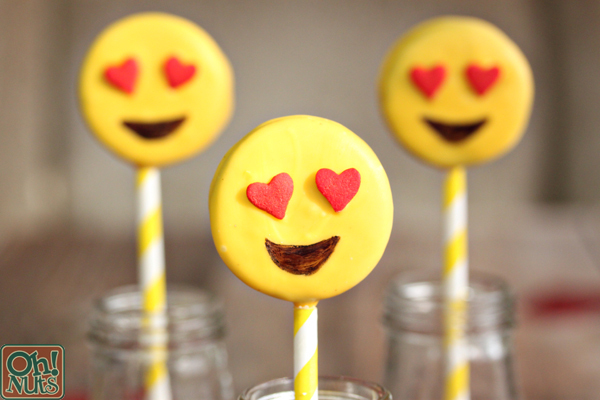 When your Heart Eye Emoji Oreo Pops are done, you can add a colorful paper straw over the lollipop sticks to make them even cuter! Stick them in individual plastic bags and tie them off with ribbons to give as edible Valentine’s, or display them in bottles or lollipop stands at a party. However you choose to use them, I know you’ll absolutely love them. Enjoy! 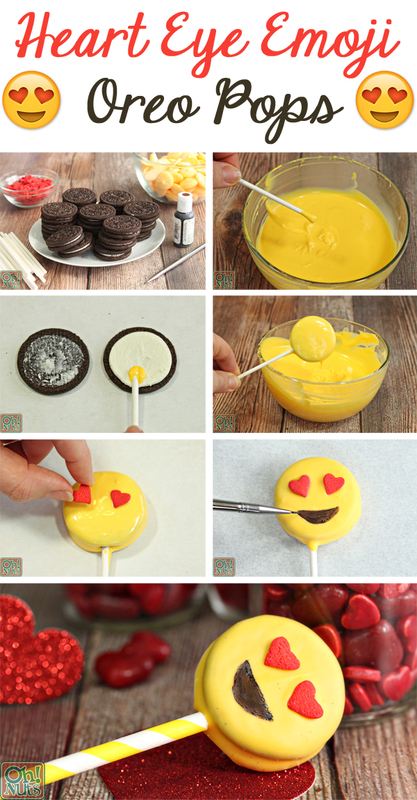 These Oreo Pops are so easy and so cute! Serve them at a Valentine's Day party or package them individually to give as gifts. Note: if you have a food marker, you can use that instead of the food coloring/paintbrush method, if you wish. Place the yellow melting chocolate wafers in a microwave-safe bowl. Microwave in 30-second increments, stirring after every 30 seconds to prevent it from overheating. Microwave until melted and smooth. Twist open each cookie. 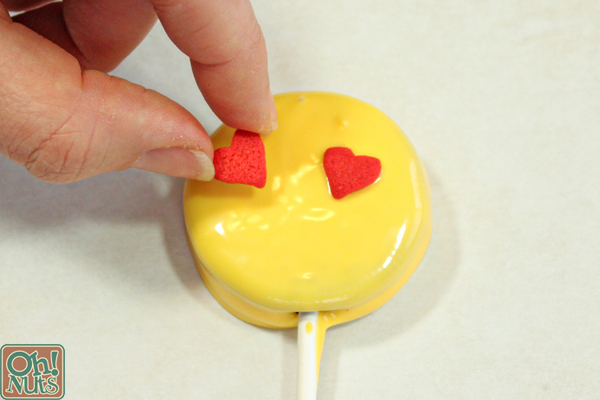 Dip the tip of a lollipop stick into the melted coating, and press it into the center of the cream filling. Spread a very thin layer of melted coating on top of the cream, then replace the top cookie and press gently to adhere them together. This step helps prevent the cookies from coming apart when you dip them. Repeat until all of the cookies have lollipop sticks, then refrigerate the tray for 5-10 minutes, until the chocolate is set. 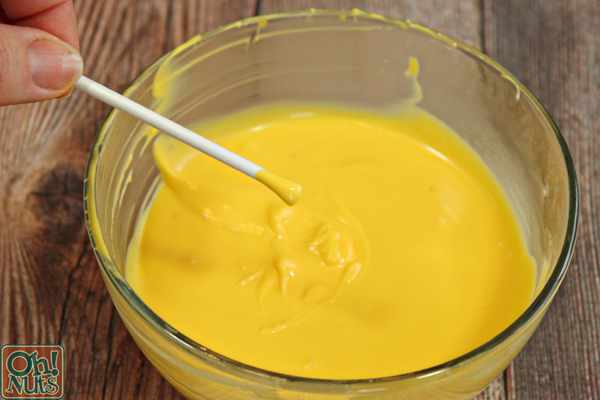 If necessary, briefly re-warm the yellow coating in the microwave until it is smooth and fluid. 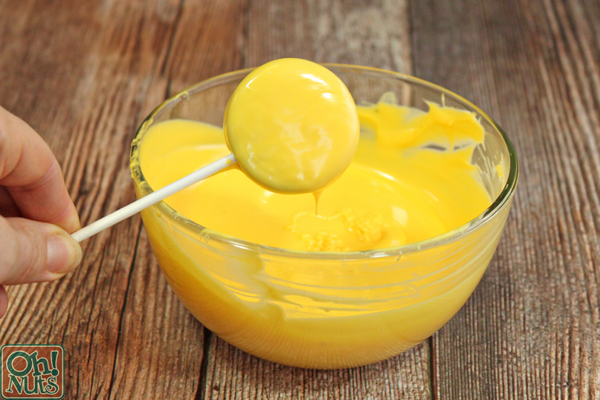 Dip a cookie in the coating until it is completely coated, then hold it over the bowl so the yellow coating can drip back down. Lightly scrape the bottom of the cookie on the lip of the bowl, to remove any excess, then place the dipped cookie back on the baking sheet. While the coating is still wet, press two heart sprinkle or heart candies on top of the cookies to represent the eyes. 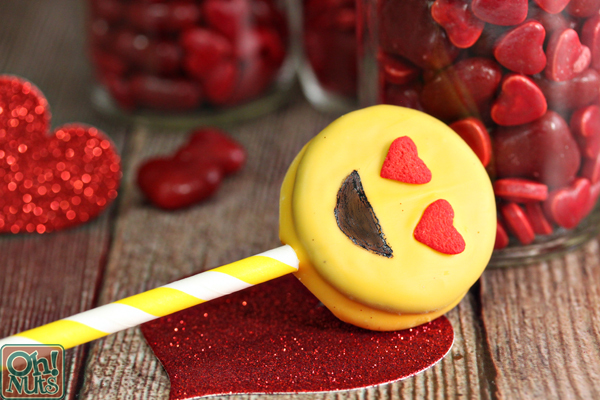 Repeat the process until all of the pops are dipped and decorated with heart eyes. Refrigerate the tray to set the coating, for 15-20 minutes. Once the coating is totally set, add the mouth. You can either use a food marker, or use food coloring and a tiny paintbrush. Whichever method you choose, add an open-mouthed smile on each pop, and let them dry completely before serving. These pops keep very well, so you can make them several weeks in advance and store them in an airtight container at room temperature until you're ready to serve.